The MCM transom saddle was designed by Midcoast Marine to reduce transom deflection, de-lamination and cracking. Its superior design also allowed for very simple and accurate motor height adjustments. Allowing your motor to be trimmed to the optimum height to get the best possible performance, without too much drag, or slip, caused by your motor being set too low or too high on the transom. 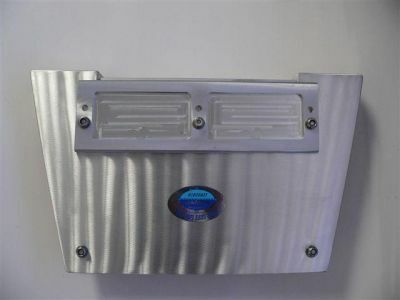 The transom saddle is fixed to the transom by 5 x 8mm stainless steel bolts, and height adjustment is carried out by the use of 5x 5mm thick aluminum stacking plates, which are fixed to the top of the transom saddle by 2 x CSK 5/16”unc Phillips head stainless steel machine screws. Apply never seize compound to the threads of these screws so they don’t seize in due to being stainless steel fixed to aluminum. In addition to the transom saddle, an alloy adjustable front clamp plate with 5mm lip is fitted to prevent the motor from slipping up or off, in the event of heavy impact, or motor transom clamps not being tightened securely. The front clamp plate is reversible also, in the event of damage. The MCM transom saddle can be fitted to any transom thickness, simply advise transom thickness when ordering. MCMTS-40: Transom saddle to fit 40 mm thick transom. MCMTS-42: Transom saddle to fit 42 mm thick transom. MCMFCP - Front clamp plate sold separately if required.